If you are reading this, it is likely that you’ve been part of our community over the years. This post was written for you. The short summary is that in 2015 we moved our headquarters to Sweden, started working with a new team full of fresh faces, focused on selling whistles and making investments in Congolese visionaries. For the world 2015 has been a dramatic year. A year where we almost daily in the news could read reports about wars and refugees, but also statements from politicians who wanted to close borders and the rhetoric of “we and them” has been frequently used. Haven’t we heard this before? Shouldn’t we have learned by know? If we look at the history it is clear to us that peace, prosperity and human rights are not created by borders. This challenge we must meet with openness and understanding. Our brothers and sisters around the world are suffering and we must not close the door. The world is changed by those who speak up! Falling Whistles have spoken up for peace since 2007 and in the last years our work has improved, 2015 was no exception. Below you will be able to read parts of what has been happening within Falling Whistles during 2015. We decided to share this as on open letter so that you could easily comment, question and respond. One of our core values is that we do not hold the solutions, the solution comes from within, from the people who know the everyday life. In the end of 2014 we meet up with our long term partner Amani, Congolese journalist Patrick and British businessman Mike in Bukavu. There was an idea of a Congolese driven business incubator. A place where entrepreneurs can come together, share experience and mentor others toward success. This idea has grown during this past year and Ensemble Pour la Difference was born. With the support from Mike and Falling Whistles Ensemble was able to start investing financial resources in people with ideas, along with the guidance from experienced entrepreneurs these ideas have turned into successful businesses.Our theory is that people do not want violence or war, but just ending the violence is not enough to see peace. In order for there to be peace there has to be an alternative. By supporting the civil society we are part of a process of building that alternative, an alternative to war. Ensemble has now invested in 32 ideas and out of those 30 amazing ones has been able to turn into a profitable, sustainable business. So why is this important to create peace? One new business will not create the alternative that we need in order to see peace, but it dramatically lifts the life of the people in the business who now have the money to support their families, money to be able to send another child to school. It lifts the life for the people in the community because they now have access to services that was not available for them before. A Pharmacy in Mumosho gives people access to medicine in an area that before was all dried up since the non-profit program that supplied medicine in the region lost it’s funding and just over night, all medicine cabinets ran dry. When a project is profitable it will start to re-pay the initial investment allowing us to use the funds again and again. Repeated enough times we will see a great change in one community, in peoples lives. Each successful project also shows what is possible. Like in Luvungi. Ensemble helped to build a bakery, and the bakery was a huge success, no matter how much bread they made everything sold out. This success inspired two new entrepreneurs to open up Bakeries in Luvungi and all of a sudden there was a sharp competition, in a place where before food was hard to find. Ensemble has also been able to start up partnerships with new companies and organizations that will be able to support the work and help the organization reach a new level. Supporting a Congolese initiative to re-build the community is the most important thing we could imagine. Sustainable peace cannot be within reach if people do not have freedom and power over their own lives. This can only be shaped by re-building communities were people are free and share a feeling of togetherness. As you and me know this can only happen if we speak up and work together. This is where we will focus all of our efforts. During 2016 we will continue to work even closer with Ensemble, provide support in communication, new partnership and growth of the organization. And of course, what ever funds we are able to raise will be channeled to Ensemble for investment in new ideas. For Ensemble, we are looking for companies to partner with, companies what want to work with us to design business that will be a part of re-building this community. We are also looking for organizations that share the same vision as us but lacks the people to implement projects with this sustainable business approach. Any individual that want to contribute to the work of Ensemble can donate directly to Falling Whistles and we will channel all donations directly towards the next investment. The past year has gone by so fast. We are thankful for all that has transpired, and also see that there are big challenges ahead in 2016. We can see that the political climate is changing. All over the world. We know the consequences of war, and how important it is to rebuild societies. If we don’t – what is left after war? Destroyed communities and unemployment. We can see that people are in need of retaking power of their own lives. We argue that one important part of that is employment and entrepreneurship. We all know by now, what the type of “us-and-them” rhetoric that has grown stronger the past year, did nearly a decade ago in Germany. Or 20 years ago in Rwanda. Or up until this day, in DRC. We are all born into this world together, and we have to work together towards peace. Peace can only be achieved if we work together as a coalition. During 2016 we will continue our work towards a sustainable society in eastern DRC. Together, we must gather in defiance. Thanks for a great 2015. And happy New Year. Beautiful clothes in colorful fabrics is a trademark for women in Congo. However, since the production has moved to China and Thailand, the clothes are coming back with expensive taxes and it is not a question of style any longer. It’s a question of poor or rich. Narcisse Bulonza Aghanze wanted to change this. She went to Uganda to acquire the art of making loinclothes, after mastering the art to a great level she went back to Congo to pass it on. With 20 women by her side she started a textile business called Shalom. Not only will women in the region be able to buy beautiful clothes for a reasonable price, 20 women will also have a job and be able to support their families and put their kids through school if her project comes true. 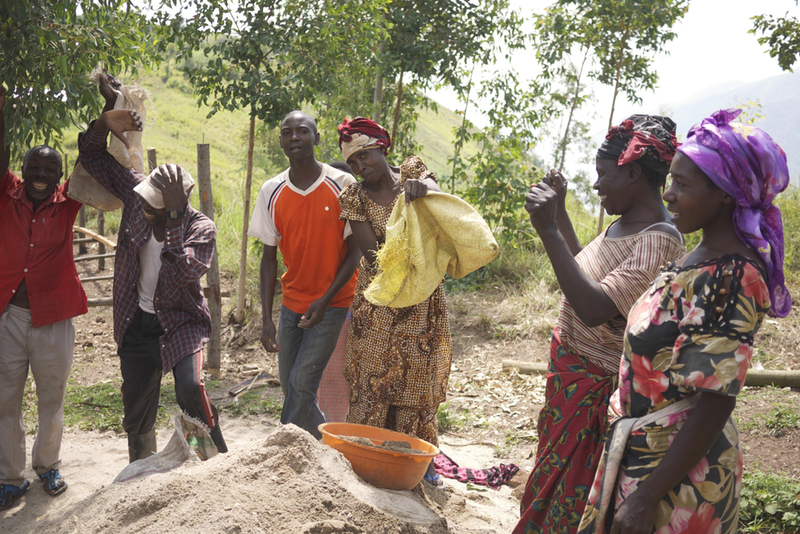 The average amount of children per woman in Congo is five to six so this project will create progress for at least 100 people, not just temporarily but sustainably. To make this project reality, we need you. Right now, we’re raising funds to be able to support them with the $15K it takes to make this happen. We’ve already got amazing help from the Yoga Challenge by Stephanie Gongora and her friends. They’ve raised almost $6000 so far. Here http://www.gofundme.com/txpttw you can read more and support their campaign. All of the donations made in August through our website will support directly this project, http://bit.ly/1OYz6kC. .
Join us towards peace in Congo. For many of us, coffee is an every day routine. It charges us back to life. It makes our eyes go from sleepy to wide open. It replaces anxiety with power and it makes us feel sharp. But what if our coffee could do more than wake us up? What if it gave children the opportunity to go to school? To lift lives? What if coffee could create a brighter future? The island Idjwi, in the lake Kivu, is home to a plethora of coffee beans and coffee farmers. 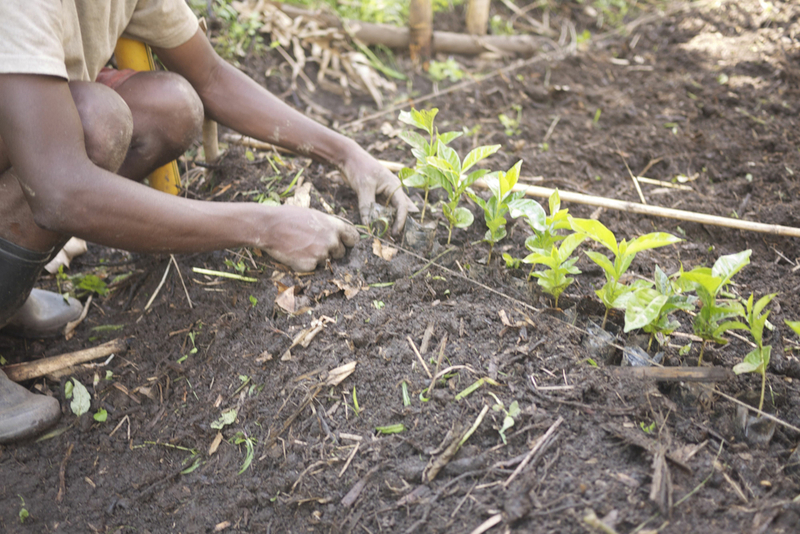 10 % of the people of the islands people are dependent on the coffee production to survive. As a result, a sustainable coffee industry has the power to change the very fabric of its society. Even a weeks worth of work producing the coffee would still not cover the cost of that one take away coffee we have in the morning. One of eight nurseries on Idjwi where the future coffee plants are created. All that said, Falling Whistles works with a coffee co-operative in Idjwi called CPNCK to give these coffee farmers access to export the coffee to a safe and open market rather than being forced to smuggle. By insuring that these coffee farmers are getting paid fair for fair work, we can see the lives of them and their families being changed for the better. Our daily cup of coffee effects their daily life. This experience has made the idea of an ethical supply change very human to us. Seeing how our choices in what we consume become part of the problem or solution has been eye opening to us here at Falling Whistles. So eye opening that we thought it was important to share with you. So enjoy your coffee, but don't forget to ask your barista what they know about it. Do they know what effect this coffee purchase is having on the farmers and families involved in the making of it? They might not have an answer to this but by us showing interest we show the market that we care, helping to create change, one conversation at a time. These are my thoughts and I'd love to hear yours. Towards peace. 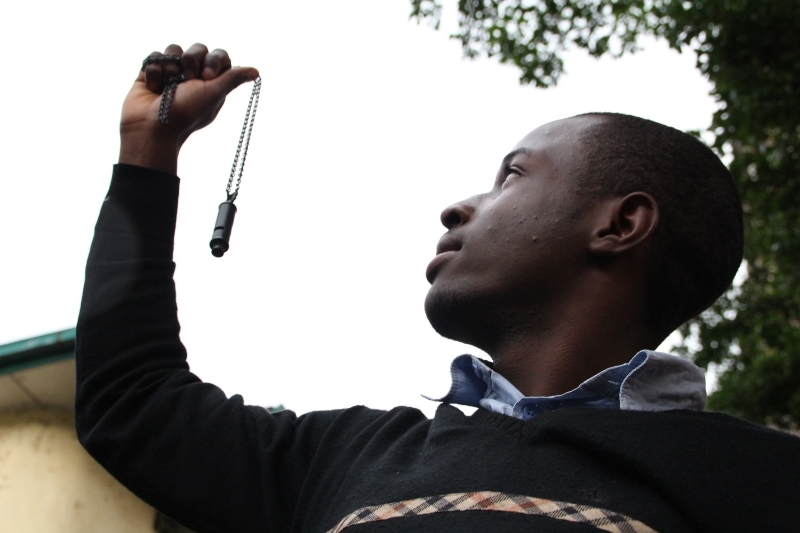 Patrick, our colleague in Bukavu, took to the streets and asked people what the whistle meant to them. He also asked if a whistle can help to create peace and their answers blew us away! So, now we ask, what does the whistle mean to you? Go to Instagram, post a picture of you and your whistle and let us know what #TheMeaningOfAWhistle is to you. Use the hashtag and we may feature your photo later on this week. So, the initial campaign period is over. Our goal was to raise $40,000 before the end of the year and as shown on our website we are just $8,000 short of that. Our biggest milestone was $30,000 because at that point we had enough funds raised to open the cafe. The remaining $10,000 is needed to make sure the lights can stay on for the first 6-8 months of operation. After this, the internet cafe will be able to sustain itself. We are still overjoyed to announce that we reached well over $30,000 and that on December 22nd, 2014, Internet Cafe no. 2 opened its doors in Bukavu. When CEO, Anders, made his trip to Bukavu at the end of November, he spent time with Innocent, the Congolese entrepreneur behind these Internet Cafes. During their time together, Anders and Innocent made this video in order to give you all a better insight into the man behind the Cafes and the importance of the Internet Cafe. So, we are still $8,000 short of our goal and we need to do something about it. We decided PROJECT:Internet will continue to run until we reach our goal. Failing is not an option. We promised Innocent that we would support his dream of building out internet access in the Eastern Congo and we plan to keep this promise. PROJECT:Internet’s sole purpose is to empower the people in Congo and support them in rebuilding their war torn country. This mission is critical for the stability we now see to be able to turn into long lasting peace. Change has to come from within and we are here to support it! If you wish to support our mission, you can visit our website (www.fallingwhistles.com/project) to donate directly to PROJECT:internet, 100% of your donation will be used to fund the Internet Café. Or, as always, you can buy a whistle. Our goal is to invest 50% of our whistles sales into the remaining amount of our total goal. We also ask that you share our mission with your friends. The more people behind us, the more impact we can have. Idjwi is the 2nd largest inland island in Africa, it is home to approximately 260,000 people and to most, it looks like paradise. While I was there I took at least 500 photos, just of the different mesmerizing views. The people of Idjwi are extremely friendly, happy and open. And to the common eye, this island may seem like true paradise. But there is more than meets the eye. Despite the rich soil and the mountains being packed with minerals, such as tungsten and tin, the conditions are very tough. 82% of the Idjwi population lives on less than a dollar a day, malnourishment is continuous battle especially amongst the children. The families are large and only of few of the children get the chance to go to a overly crowded school. About 18 months ago, Falling Whistles started working with a Idjwi coffee cooperative called CPNCK. During the time, CPNCK was organized of about 100 farmers who hoped that one day they could start selling coffee on the open market instead of risking their lives while smuggling the coffee to Rwanda. By working with us this past year and a half we have helped CPNCK through this process. We have also provided the funding for them to get started filling containers of coffee to bring to the market. So far, two containers of conflict free coffee have been exported, and one more is on it’s way. The goal for next year is 6 containers! These numbers may seem small but for the Idjwi community they are huge because getting a fair price for the coffee grown on the island will have a significant and long lasting impact. Not only will it keep the farmers safe from smuggling but it will help shift the financial climate on the island. During my visit to Idjwi, I was able to meet up with CPNCK to do some productive training sessions and business planning. I also was able to visit the coffee farms and the new washing stations that were being built. The washing stations are used to help increase the quality of the coffee produced. This is essential because the higher the quality then the higher the price for the same amount of work. It was exciting to see how far along CPNCK has come and to see Gilbert, the Congolese who runs the cooperative, continue to do a great job. The continuous smuggling to Rwanda has played a significant role in the widowing of many women on the island. Men experience extensive danger while smuggling to Rwanda, the water itself can be very dangerous and even if the men are to make it over, it has been known that many times the buyer on the other side may kill these men to take the coffee rather than buy it from them. My eyes were opened to these dangers of smuggling after my visit with Mama Katanbara, a Congolese widow who emphasized the fact that life on the island is hard enough as it is but it gets much harder once you become a widow. After spending some time on the island with individuals such as Gilbert the coffee cooperative manager and Mama Katanbara, one thing was made prevalent to me; that even through all the hardship and heartache, Idjwi still has a sense of community. We, here at Falling Whistles, are always talking about the importance of community, but instead of talking about it, these Congolese individuals in Idjwi are living it out each day. Each day these individuals realize that their faith and own survival is directly connected to the people they are surrounded by. They understand the concept of teamwork and how it all makes sense for them to work together for the common good. I was truly inspired by the people I got to connect with on the Idjwi island and I can’t wait to work further with the widows, the coffee makers and the community. See you soon, Idjwi.